It’s no secret that folks who struggle with infertility go through a lot of heartache. And to call the IVF treatment process “emotional” is an understatement. For many couples as well as women trying to get pregnant on their own, it can take years of pitfalls before they finally get the good news: a positive pregnancy test. So when it’s time to share that moment they’ve been hoping and praying for, why not go all out? Just try not to tear up at some of these pregnancy announcements from IVF parents-to-be — most of which were years in the making. But as you can see, it’s all well worth the wait. Ryan Strzelecki’s relief at hearing his baby-to-be’s heartbeat for the first time is contagious. He and his wife, Annette, tried to have a kid for 1,041 days (that’s almost three years). And his advice for other couples experiencing infertility is sweet, albeit a mixed metaphor: “For anyone who may be going through the emotional roller coaster of trying to start a family, have faith and lean into your partner as you navigate this river,” he wrote. It is with extremely full hearts, a ton of joy, and great humbleness that Annette and I can officially share our big news! We have laughed a lot, cried a little, and grown closer as a family over those 1,041 days of waiting. For anyone who may be going through the emotional roller coaster of trying to start a family, have faith and lean into your partner as you navigate this river! Lots of love! Talk about a journey! This adorable family has been through a cancer diagnosis, six rounds of IVF and four devastating miscarriages. So 60 fertility appointments later, getting pregnant felt like a true miracle. Their video pregnancy announcement will likely give you goose bumps. Plus, look how excited their son is to be a big brother. There’s a lot of love and struggle that goes into an IVF pregnancy journey. But when it came time to announce her pregnancy, @capturedbycourt also wanted to give a shoutout to the unsung hero of the process: science. “The last few years have been full of so many wonderful adventures,” she wrote. “However, I would be lying if I didn’t say those years were also filled with challenging trials and heartache. I am so excited for a new adventure this February!” Congratulations on finally reaching your next chapter. P.S. : The onesie is available on Etsy. Menopur, blastocyst, retrieval… IVF parents get to know all the infertility lingo. 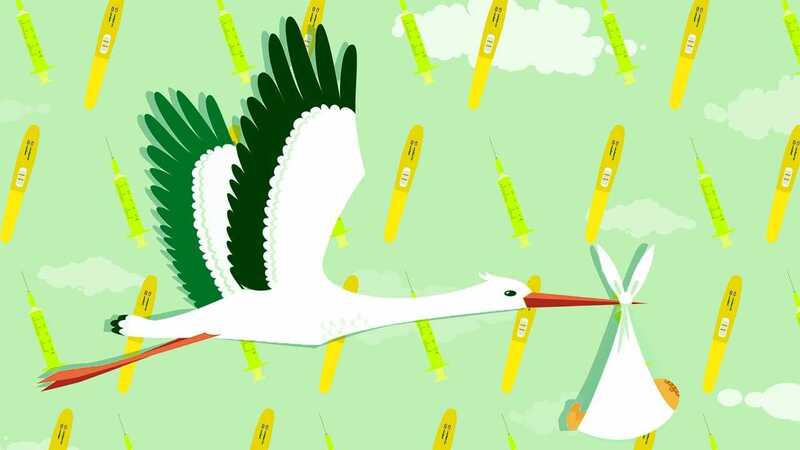 And it was all too familiar-sounding for @thescientificstork, who was TTC (trying to conceive) for three-and-a-half years before she got a BFP (big fat positive) pregnancy result. And you can see the happiness and disbelief on her and her husband’s faces when they finally got the news. Her post sums it up perfectly: “Three and a half years, 66 shots (in 39 days respectively), over 100 pills, one surgery, two procedures, almost 20K, and countless tears… all for this moment,” she wrote. Now her adorable twins are a year old and proof that dreams really do come true — with the help of science, that is.